A model displays satellite reception with LG Electronic's SB120 cell phone. When it comes to wireless innovation, South Korea is among the leaders. Mobile technologies that will start to make their way to U.S. users in the next few years already are the norm there among consumers and traveling businesspeople. Mobile phones in Korea can be used to create content such as photos and video. (In the United States, content is typically pushed to users' mobile phones). 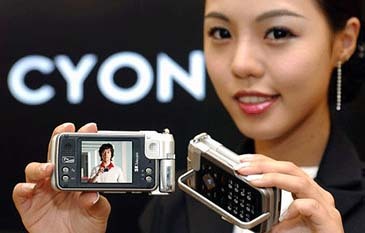 Three- to 5-megapixel cameras embedded into phones are a must, as well as eight-channel live TV. In some of Korea's more densely populated areas, GPS-enabled traffic mapping on phones helps commuters stay away from congested roads. E-commerce features let consumers pay for groceries using their phones. And businesspeople engage in live videoconferencing sessions with colleagues using their phones. Koreans love their high-tech phones so much that they'll spend up to $600 on them, according to execs at Magnolia Broadband Inc., a chip developer that puts "smart" antennas into cell phones sold by top service providers in Asia. Magnolia's chip helps cell companies provide better coverage by combining transmit and receive radio-frequency signals from two antennas. It also improves data throughput and the phone's battery life, the company says. Magnolia and SK Telecom, Korea's major wireless communication services provider, signed an agreement a year ago to deploy a chip that SK Telecom will add to cell phones and other mobile devices to increase data rates for wireless services, which make up between 25% and 30% of SK Telecom's revenue in Korea. The chip is expected to increase network capacity by more than 45%, coverage by up to 60%, and data rates by 10% to 140%, says Magnolia's CEO Osmo Hautanen. The chips still haven't made their way to the United States, but it's only a matter of time. If you want to see anything new in wireless and broadband, you should go to Korea, Hautanen says. "You will most likely see the same thing between six to 18 months later in the U.S.," he adds. Once new services hit the U.S. market, they can have big implications for consumers and businesspeople. For example, with higher data rates, unique applications can be created for mobile devices that aren't available today. Don't be surprised if that includes putting radio-frequency identification chips into cell phones so a consumer can purchase a Coke from a vending machine simply by waving the phone in front of it. Korean cell phones have been integrated with many banking systems so people already are buying groceries with them. But before any of the new Asian mobile technologies take off here, U.S. carriers must have the networks to support these services. Cingular, Sprint, and Verizon Wireless are building third-generation cellular networks. Manufacturers also will have to create mobile devices that support these services. "It will put the Korean OEMs like Samsung and LG Electronics in a strong position over U.S. OEMs, who might be doing this for the first time," Hautanen says. It looks like the Koreans will retain their edge in this area for the near future. The above article is from Information Week.